"This delicious recipe turns out slaw just like the famous coleslaw at a popular fried chicken restaurant chain!" A creamy, sweet-tart salad that tastes like a popular chicken restaurant’s slaw. All we could taste was the lemon juice. It hid the flavor of everything else. It was also incredibly runny. I'll keep looking for another coleslaw recipe. Use this recipe in my catering business. I cut the quanty of milk in 1/2. Not quite so liquid. 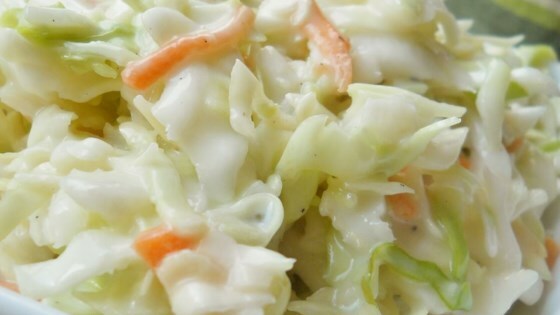 This is the best coleslaw ever ~ tastes just like KFC. The buttermilk is the *key* here ~ I even replce the milk with all buttermilk. so easy and so good! make this at least a day ahead. use that slaw mix at the grocery store, no big whoop there. it does taste better than kfc! i love this with grilled chow!